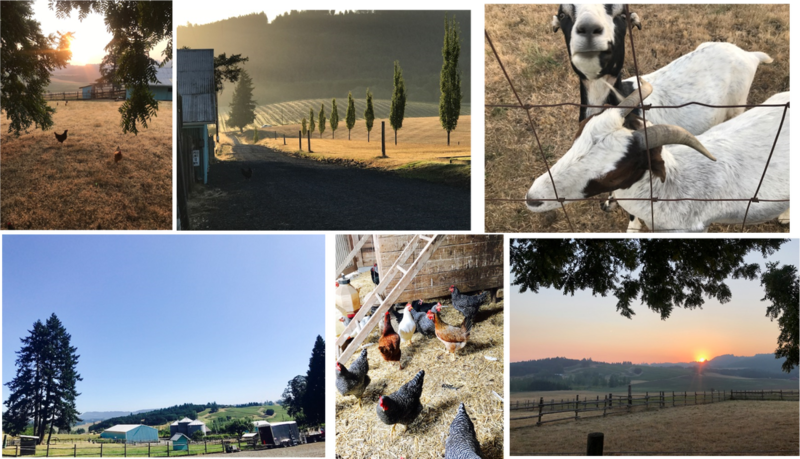 Abbey Road Farm’s mission is to celebrate the bounty of Yamhill County, be stewards of the land and bring Abbey Road Farm to its fullest potential. Our intent is to use organic practices in all farmable acreage (vineyard & produce), utilize sustainable energy when we can and educate and inspire our guests to appreciate the land where their food comes from and create an association between celebration, hospitality, and a connection to the land. As co-owners of Quaintrelle, a farm-to-table restaurant, Daniel and Sandi Wilkens have developed a great appreciation and admiration for the agricultural landscape in Oregon. From the moment they stepped onto Abbey Road Farm, they felt an immediate connection to the land. They envisioned a destination that celebrates the bounty of Yamhill County and their passion for food, wine, hospitality, and agriculture. To fulfill their vision, they are converting the farmable acreage into a vineyard and produce farm. They will focus on lesser-known grapes, in addition to pinot noir. The produce farm will supply their own farm-to table restaurant, as well as other establishments and farmer’s markets. They will continue the Silo Suites B&B operations! The goal of the farm is to be a place where anyone can come and enjoy the best of Oregon’s food, wine and hospitality. This is carrying on the vision of the former owner who fell in love with the concept of “agritouismo” while spending a good portion of his youth in Europe. They want to honor his vision and take it to the next level. As General Manager of Abbey Road Farm, Emily oversees all operations and projects on the farm. As co-owner of Quaintrelle, she has a passion for all things food, wine and hospitality. Owning and managing one of Portland’s best farm-to-table dining experiences has really expanded her knowledge and appreciation of the small-scale farms that are growing some of the best quality produce in the state. She also has a fondness for the smaller wine producers in the valley that are creating some really amazing wines with lesser known varietals. She is looking forward to creating a space that honors these wildly talented farmers and winemakers and wants to educate guests of the property about the importance of agriculture and hospitality in the region. Emily moved to Oregon from Northern Virginia 20+ years ago and never looked back. She has a background in restaurant management, marketing and project management. She enjoys exploring new restaurants, traveling and playing golf terribly. James began his career in earnest at Café Campagne in Seattle. Under the patient guidance of Sommelier Shawn Mead, James began his long quest to understand wine. Upon moving home to Chicago he quickly resumed his studies as General Manager of Chicago favorite Café Matou. For six years he honed his craft as a new Sommelier. In the spring of 2010 Stephanie Izard was about to open Girl & the Goat and asked James to come on board as Wine Director – and of course James accepted. Unexpectedly it was James’ first minor fray into winemaking as he partnered with Saviah Cellars in Walla Walla to create the house blend for Girl & the Goat. It did not take long for James’ desire to make wine to take hold of him and after another year he found himself on the way to Portland, Oregon to gain employment at Ponzi Cellars in the Willamette Valley. Under the close tutelage of Luisa Ponzi and her associate winemaker JP Pierce James learned the beginnings of winemaking. In 2013 James sought to purchase 500 pounds of Riesling from Brooks Vineyard to further his making education. What was expected to be a very small learning exercise and quarter ton of Riesling quickly became 2 ½ tons of fruit and James Rahn Wine Company was started. Since then James has focused on producing small lots of site-specific wines that include Gamay, Pinot Noir, Pinot Meunier, Pinot Gris, and two sites of Riesling. For James – joining Abbey Road Farm to create a new winery is a dream come true. He will be overseeing all winemaking operations which will include wines for Abbey Road Farm, Wilkens Family, James Rahn Wine Co, as well as co-op and custom crush operations. In addition, with the help of Stirling Fox James will oversee vineyard operations. Kristen has a passion for all things events. She brings over 14 years of experience in events and promotions including weddings, corporate functions, fundraising campaigns and social functions all over the Portland metro area. She is a 20+ year Oregon resident who moved from Southern California to attend school at the University of Oregon (Go Ducks!) where she received her degree in Journalism and public relations. When she is not helping folks put together epic celebrations she is with her husband and two spunky children taking road trips, camping, kayaking or enjoying the amazing food and wine that Oregon has to offer! Chef Eric Bartle and Sara Kundelius, better known as The Wilderness Hunters, have spent the past five years traveling seasonally across the US managing remote lodge properties from Alaska and Wyoming to most recently, a 130 year old fly fishing club and farm in the Catskill Mountains of New York. The husband and wife chef couple have worked to integrate farm-to-table ethos into all aspects of their personal and professional lives, from raising turkeys, sheep, laying hens and meat chickens to growing and preserving their annual garden bounty. In conjunction with their passion for growing the best ingredients, fostered by Chef Eric's years in the kitchen of James Beard Award winner Greg Higgins, these two have also spent the majority of their free time exploring the forests, mountains, rivers and coastline of Oregon in search of choice wild mushrooms and edibles, Oregon truffles, wild game, fish and shellfish. Nate Brown is a native Oregonian who was raised in Carlton, OR on his parents farm just one mile northwest of Abbey Road Farm. He has witnessed Yamhill County evolve into world class wine, food and craft beer tourist destination. Nate has amazing experience and skills to bring to his new role at Abbey Road Farm. He worked for his parents vending business, in the Public Works Department for the City of McMinville where he ran the sign shop for the building and street maintenance department. In 2015 he went to work at Stoller Family Estate where he was quickly promoted to their Facilities Manager. Nate currently lives in Carlton with his wife Mary and daughter Ana. Nate enjoys hiking and doing other outdoor activities with his family. Nate has been an artist and painter for 20 plus years and focuses on local scenes, wildlife, people and places that he experiences. He is very excited to be a part of the Abbey Road Farm team. It is great to get back to his local roots, and have the opportunity to get involved with an up and coming, one-of-a-kind wine country destination!